By Tara Nieuwesteeg | 2 years ago When he went into cardiac arrest, a nurse came to his side. But at too many schools, no one is there to answer the call for help. By Eve Hill-Agnus | 2 years ago The Trinity Groves restaurant is an adventure for the vegan and meat-eating alike. By S. Holland Murphy | 2 years ago The stylist is trying to make real news with The Clad Life, her "all-inclusive brand for aesthetics." By Dan Koller | 2 years ago Faith is central to Dallas Baptist University baseball games. So is winning. 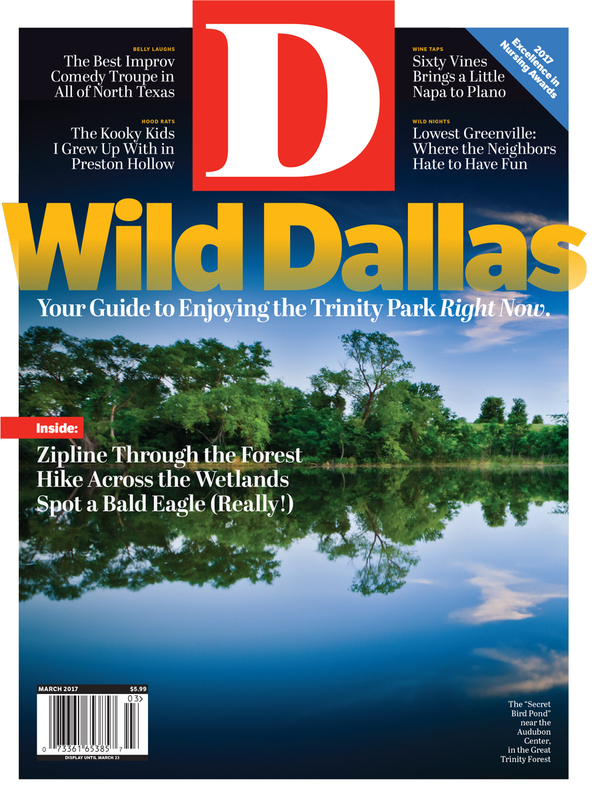 By D Magazine | 2 years ago The executive director of the Deep Ellum Foundation shares what she loves most about the city. By Barrett Brown | 2 years ago A trenchant childhood remembrance. By Tim Rogers | 2 years ago The Garland Road bar has an aesthetic inspired by '70s airport lounges. By Stephanie Quadri and S. Holland Murphy | 2 years ago She believes in architectural cuts and unexpected pairings. So does her famous follower, Rihanna. By Kathy Wise | 2 years ago For the next big life event you want to celebrate or family member you'd like to commemorate, consider a living memorial that everyone can use and appreciate. Here's how. By Eve Hill-Agnus | 2 years ago The Lowest Greenville restaurant remains the standard-bearer for Japanese barbecue in Dallas. By Merritt Tierce | 2 years ago Snow, rain, and bloodthirsty mutts couldn't stop her. By S. Holland Murphy | 2 years ago The Addison company's new vinyl-pressing facility is bringing the music back to town. By D Magazine | 2 years ago A few creative ways to wear the color of the year. By Tim Rogers | 2 years ago The seasoned attorney takes over a troubled DA's office. By Christiana Nielson | 2 years ago For its musical adaptation of The Tempest, the organization is creating a brave new world of amateur thespians. By Eric Celeste | 2 years ago Don't blame the "restaurant bubble" for recent closures. Blame the neighbors. By Catherine Downes | 2 years ago The 63 Degree Farm Egg adds a few twists.